James Johnston Pettigrew was born on July 4, 1828, at Bonarva Plantation on Lake Phelps. His father operated several large plantations in neighboring Tyrrell and Washington counties. At age 14, he entered the Uni­versity of North Carolina, where he gradu­ated in 1847 with the highest honors. At the commencement were President James Polk and the Secretary of the Navy, who offered him a professorship at the U.S. Naval Observatory. After six months there, Pettigrew began to study law in Charleston, only to leave to study in Europe that same year. When he returned in 1852, Pettigrew continued to practice law in Charleston and later becoming an officer in South Carolina’s militia Pettigrew participated in the bombardment of Fort Sumter in April 1861. Unable to receive a commission in South Carolina’s forces, Pettigrew took an appointment as colonel of the 22nd North Carolina Infantry. 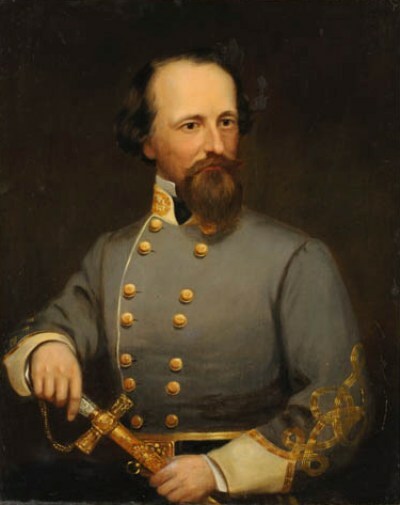 Despite Pettigrew having no real combat experience, Jefferson Davis made him a brigadier-general just before the Peninsula Campaign. Although he claimed to live on “private’s fare,” Pettigrew had a personal servant. Severely wounded at the Battle of Seven Pines, Virginia, Union forces took Pettigrew prisoner. After his exchange, Pettigrew became a brigade commander. During the Battle of Gettysburg, Pettigrew’s Brigade took part in George Pickett’s famous charge of the Union position on July 3, 1863. Wounded in the hand, Pettigrew supervised the Confederate retreat from Pennsylvania. At Falling Waters, West Virginia, Union cavalry caught up with the Confederate rear guard. Shot in the stomach, Pettigrew died three days later on July 17, 1863. Buried in Raleigh after an official day of mourning, his family eventually moved Pettigrew’s body to the family cemetery at Bonarva.